I think you might already know how much I love yogurt--I really really do but have to be VERY careful how much I consume. Most all dairy products are high in sugar which is no good for diabetics like me. And then there are those of you who are lactose intolerant. But now--we too can have our yogurt-that smooth, creamy goodness without worrying. 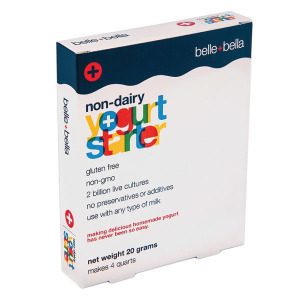 Why-because Belle+Bella have come out with a NON-DAIRY Yogurt Starter! You can use Almond Milk (which would be my preference) or any other for that matter. "All natural, delicious creamy yogurt that’s good for you with billions of live cultures and no additives or preservatives. Now you can make a true non-dairy homemade yogurt from any type of milk for only pennies a day! I used to take Acidophilus pills to combat yeast infections--had I had a yogurt maker and had this product been out back then I most certainly would have bought the yogurt maker and probably saved a bunch of money! 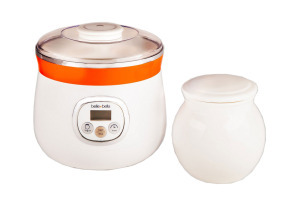 Yes, Belle+Bella also sell a Yogurt Maker! "The legend has returned. We revolutionized home yogurt making in 1967 with the Yogomagic yogurt maker and we are again revolutionizing home yogurt making! Now, homemade yogurt is as easy as pouring milk! MSRP – $69.99 Available in November 2015"
No, I haven't tried this, but wish I could!! Check it out--you know you all prefer to know what exactly goes into your foods-with this you will. And, which does my environmental heart good--less plastic in the landfills!! I received either product or monetary compensation for this post. All opinions expressed are my own honest opinions. For more information please check my Disclosure Statement. Our giveaways are in no way sponsored or promoted by Facebook. I love yogurt and have always wanted to make my own. Looking into getting this for Christmas. This sounds great. I like the idea of making your own yogurt. I will look more into this. I would love to make my own! My hubby is lactose intolerant, so this would be perfect for him. I am going to be purchasing this! My 8 year old is allergic to casein protein. I wanted a yogurt maker years ago. I never got one but I did make yogurt on my own in a pot. I was fun. I love this idea! You know what's being added to it and with having a child that is Lactose Intolerant, this would be perfect! This would be great for me, though I am slowly running out of space in my house for more gadgets and gizmos, I could definitely benefit from it! Who doesn't love yoghurt! So cool!! I have to have soy and yogurt is usually not on my menu. I love the yogurt maker and starter kit!! I've considered getting one, it looks like they have really thought of everything for us non-dairy consumers. I would love to try this! In my adult years I have an aversion to yogurt, even though I still enjoy from time to time it doesn't sit well. I drink almond milk and would love to make almond yogurt. Great product! My wife loves almond milk and I'd bet would love this. Never even thought about making our own at home! Now I have to go have some but it will not be from this. Maybe someone will gift me one for the Christmas - I have to promote this to them. The Belle Belle yogurt maker is an awesome product indeed for my sons. The so love yogurt and one of them is has allergies to soy along with wheat etc. so this is a perfect gift for them both. I didn't know their was even yogurt makers. I would love to win this yogurt maker so I could make my own yogurt whenever I wanted to. That sounds so cool. I've never made my own yogurt, but I know it would be fun project. Plus, I wouldn't have to worry about unnecessary sugar being added. I'm sure my husband would love it, he definitely love yogurt. Perhaps I should put this on my Christmas list. It sounds like it would get used all the time! I would love his, I love eating yogurt, it makes me healthier. I could use this. I love yogurt too and I really like the idea of being able to make the best, healthiest version of it. It must be very convenient. It would be an ideal gift to anyone who is lactose sensitive but still wants to enjoy yogurt. Very nice!